I rarely read fiction. I naturally gravitate toward autobiographies if I’m in the mood for a good story. However, I couldn’t resist this book when it was offered to me in exchange for my honest review and I’m so glad that I read it! I read the entire thing in two days because I couldn’t wait to find out what would happen. 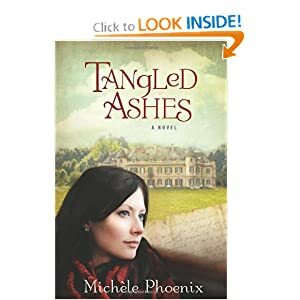 Tangled Ashes is a work of historical fiction that is filled with mystery as the characters develop and the story unfolds. The author’s development of the characters is excellent and they felt very real, very human. She skillfully intertwined true historical facts with incredible characters of her own, while also creating emotional attachment to the characters for the readers. I was intrigued the entire time and couldn’t wait to see where the story was going. Synopsis: Becker, an American, arrives in France to begin the renovation of a renaissance-era castle. While there, he discovers a dark World War II history that provides a glimpse into the Nazi occupation during that time period. Throughout the book, we are taken back to 1943-1944 and are given the story of two young women who lived in the same town that Becker is now in for the renovation. I truly loved it. Michele Phoenix is a very talented writer and there were so many elements that I appreciated in this book! I learned more about WWII than I knew previously, and it made me want to know more about the Nazi occupation of France. I highly recommend this book for any age. It is clean, it contains spiritual truths, and it is written with historical events in mind. I received a free copy of this book from Handlebar Marketing in exchange for my honest review.